Reasons you should NOT Buy or Fly a Drone! Wait! This is a site which promotes the safe, fun and productive use of aerial robotics (aka “drones”), so why would we produce such a story as this? Simple – because it’s the truth and we want to save a lot of people money, time and trouble. Note – as time has gone by, it seems this model has fallen further behind in terms of features available for the dollar. Please read the review based on when it was done…over a year ago (4/2013) – and use our conclusion and this note to determine whether this fits your exact needs. Dualsky is a well regarded manufacturer in the R/C model industry, and highly regarded for their motors – one of the key ingredients in any quadcopter. Hobbyists have long been using their motors and other parts to build their own machines, but until now Dualsky did not produce a complete quadcopter. This has changed with the introduction of their Hornet model, billed as an ARF (almost ready to fly) quad which is 90% assembled. Droneflyers.com purchased, assembled and is now flying a Hornet. Advanced Beginners UP for manual flight, payload (camera) carrying and hobby use. What you need to fly the Hornet! The Hubsan X4 ($60-$70) made a big splash when it was released a few months back. It’s a miracle of engineering, being one of the smallest quadcopters made and yet having very advanced features. Notice that it lack gears – this is a direct drive machine! It also features a 6-axis stabilization system, as opposed to the 3 or 4 axis on most lower cost quads – this results in an amazingly stable craft – even in wind! However, you may notice that some reviewers love it and some hate it. 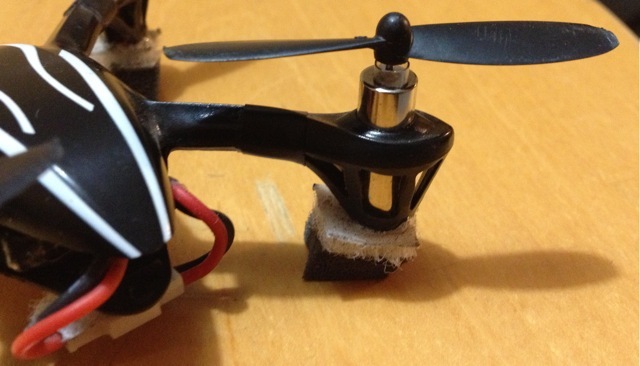 In most cases, this should not be your first Quad or your first radio controlled flying machine! It is not for complete beginners, more for advanced beginners all the way up to expert. It comes complete with the quad, a transmitter, a USB charger and a single battery. Some merchants and packaging contain an extra set of props. 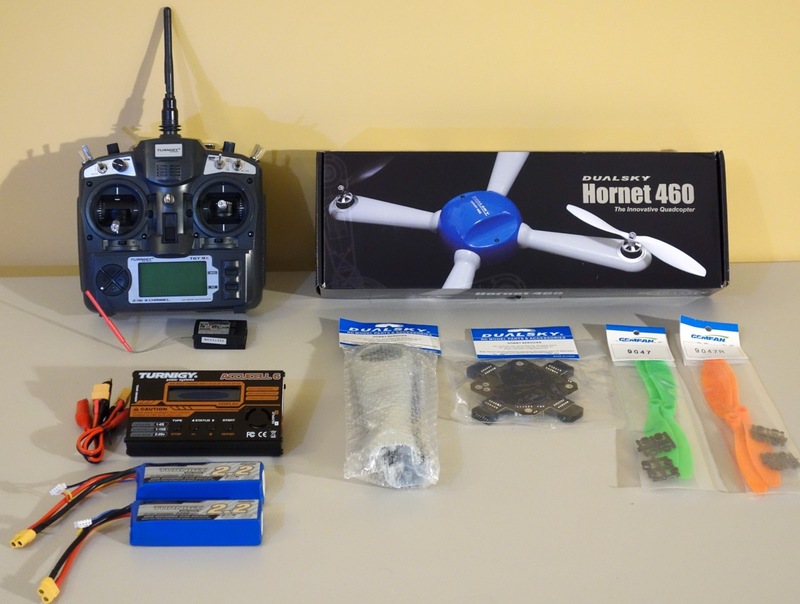 My advice, before you even start using this quad, is to purchase at least 2 extra batteries, 2 or more sets of props and one of each (CCW and CW) motors. This way you will be ready for the first repairs and replacements! Flyers with no experience are likely to crash the Hubsan too many times before they get the hang of it, resulting in a poor experience and a broken quadcopter. How do I know this? Easy – I did it myself. BUT, once I took more time to learn on the cheaper Syma X1 and read up on the X4, I then had the confidence to start using the X4 in the way it was intended. A couple caveats – you must do a few of the “mods” suggested by other users before flying! These include at least putting some soft foam or other material under each leg and the “electrical tape mod”, which keeps the arms from detaching as easily as stock. There is a third mod called the “straw mod”, which you can look up – it helps make certain you will not destroy a motor as quickly. Super-stable flight – corrects to level when you leave go of stick! The designers never quite finished this model – hopefully future versions will be improved…..
Mods need to be done – should have been designed into it. You need good eyes and slight of hand to replace parts – and you WILL have to replace parts! No real support unless you buy the (more expensive) Traxxas labeled version. 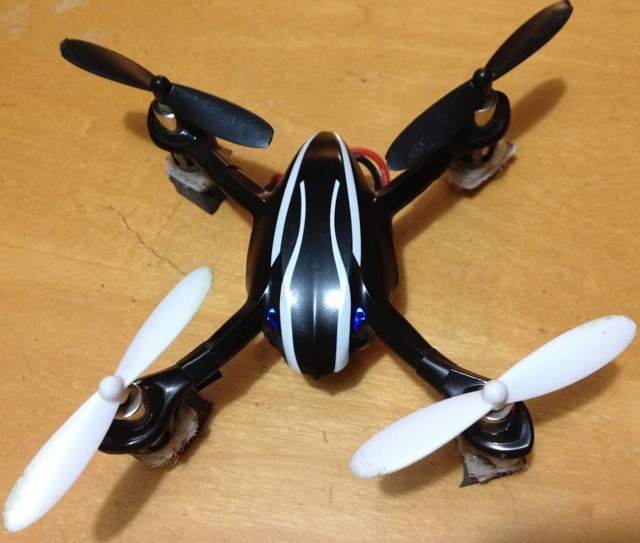 In summary, if this is your first quadcopter it may be your last. But if you are a hobbyist and don’t mind working on your machines, you may love this thing no matter what level of flyer you are! If you are a good flyer and don’t crash it hard and often, it may just become your fav! When it works as it should, it’s hard to beat for inside and close quarters outdoor flying. Charge your battery using the included USB charger or proper other charger. Do not overcharge the battery – read our article on Lipo batteries for best practices. Insert battery into X4 making certain you press it fully rearward into the copter body. Connect the battery terminals while the transmitter is still powered off. Set the X4 on a level surface and turn on the transmitter. Make sure your transmitter throttle is fully in the down position. The blue Hubsan “eyes” will be alternately flashing at this point until you turn on the transmitter. A few seconds after you turn on the transmitter, a loud beep will indicate it has bound to the quadcopter – at the same moment, the two blue “eyes” will stop flashing and just stay lit. Your X4 should not be ready to fly. Be sure to follow some of our hints in the videos in terms of learning to fly it. 2. Reconnect battery – place quad on level surface and turn on and bind transmitter (BEEP). 3. Do a “stick wiggle” reset of your quad before flying. This is done by holding your throttle (left stick) in the lower right position as far as it goes, and then wiggling your right hand stick back and forth left to right (quickly). You will see the lights on the X4 blink, indicating you have reset the main board. Inspect and replace your X4 propellers as needed. They will often be bent down after a bad crash – you may be able to straighten them out by hand. Make sure they spin freely and are as level as possible. 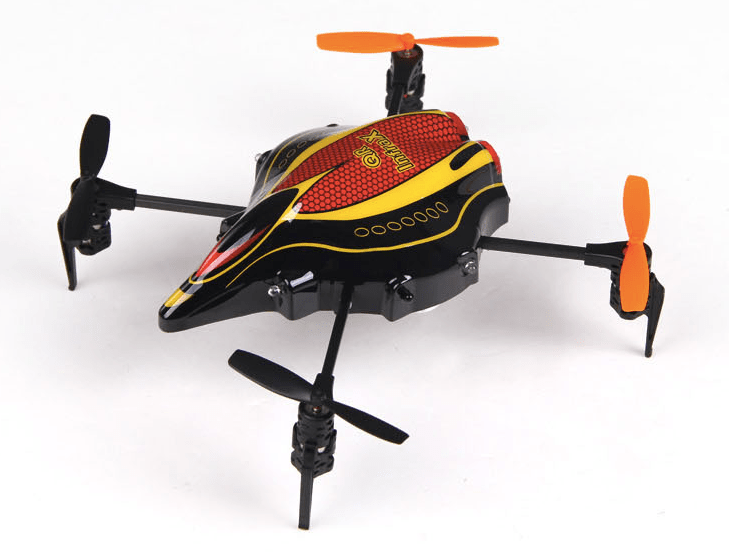 There are some other small mods which will add greatly to your fun factor and ease of flying the X4. One involves the battery connector, a very small assembly commonly called the walkera plug or connector. The good news is that these connectors go together easily – the bad news is that it is near impossible to take them back apart! 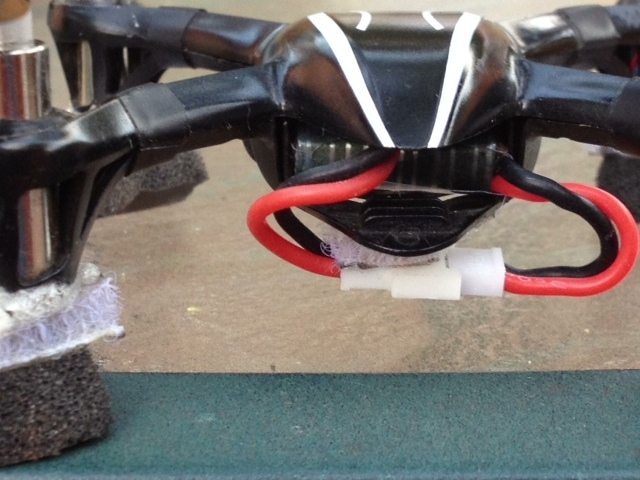 This can be very frustrating and lead to your ripping out the leads from either the battery or quadcopter. The solution is quite easy – use a very small file (nail file works well) to sand down the two small nubs which lock the connectors together. 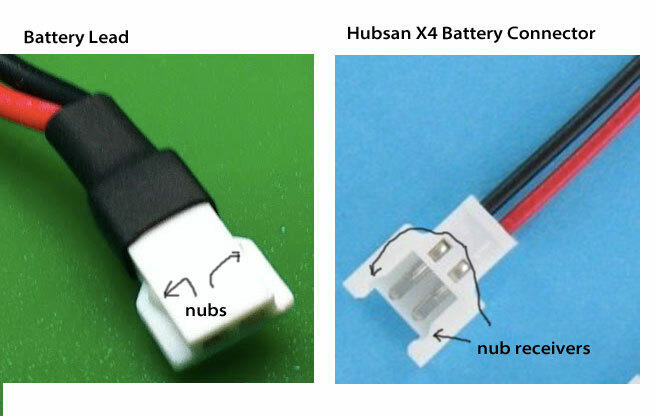 These nubs are on the BATTERY connector side – not on the quadcopter. Note the pictue below which shows the nubs (on your batteries) and the nub receivers (on the wire connected to your Hubsan circuit board). Remove the small plastic nubs from the battery connector – shown on the left above! Velcro keeping the battery connectors from straying! Here is a quick vid of inserting the battery, binding to the transmitter and indoor flight. Here are some beginners tips for flying it! Walkera QR Infra X – small but sophisticated! 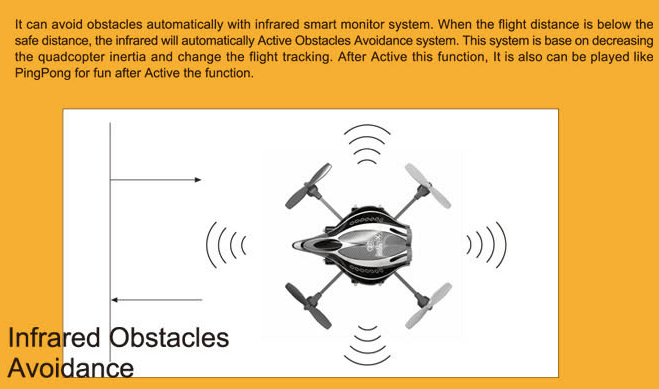 This quadcopter has collision avoidance! In addition to the infrared sensors, this quad also had down-facing soundwave sensors which determine it’s height above solid objects. It can literally walk up a set of stairs! This is not the quadcopter for everyone, but for those who do indoor/garage/basement flying and who are interested in the advancing technology, it offers an amazing value for about $150. Here is a hands-on review of the QR from RCproreviews. 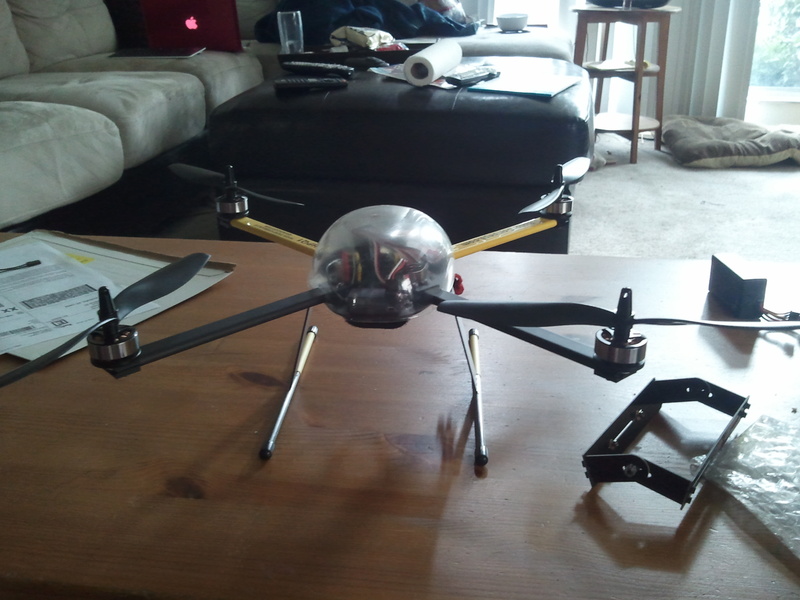 The AR Drone is very simple to fly but does not fly like anything else on the market. If you are going to move up to bigger or more advanced quadcopters you are going to need a different set of flying skills. In this article we are going to start learning how to fly them and help you get your copter off the ground. The first thing you need to know is that flying a quad is exactly like flying a R/C helicopter. The controls are exactly the same so if you have helicopter experience, you can easily fly a quad while flying a quad is excellent practice for flying a helicopter. Why Doesn’t My AR Drone Fly Smooth? Hang out in any AR Drone forum long enough and you will hear people asking why their drone doesn’t doesn’t fly as smooth as the YouTube videos they have seen. Videos show fast forward flight with smooth transitions to full stop or other smooth maneuvers. However, when you fly your fast forward flights end almost in a backflip and sometimes a scary loss of power. What is wrong with your AR Drone that it doesn’t behave the same way? The short answer….it’s probably you. What I see quite often with new users is while the drone is in forward/reverse or left/right flight, a new owner will take their finger off the tilt control. This action will cause the auto-pilot to kick in and try to stop the drone as quickly as possible. For example, if you are in fast forward flight and just take your finger off the controls the nose will pitch up very sharply as the drone tries to come to an immediate stop. Usually, it will just recover and all will be good. However, on some occasions, things can go terribly wrong. With the bottom not pointing at the ground anymore, the altimeter can get confused and the drone will think it is too high, shutting down the motors. If the drone is too low, it might stall and hit the ground. If you have the altitude limiter off, it can think that it is transitioning into blind-flight mode and take off vertically, causing a fly-away. Is there a solution to this? There sure is. Instead of pulling your finger off the tilt control, keep your finger in place and tilt your device in the opposite direction. Surprisingly enough you can stop an AR Drone extremely quickly while keeping it completely under control. The main message here is “don’t panic” and always think ahead about what you are doing. As soon as you start moving forward, think about when you are going to want to stop instead of thinking about where it is right now. This kind of control is actually pretty hard to learn when flying around your house or a small backyard. Once you get the drone out to a decent sized area, at least 75′ x 75′, you will have enough room to really to learn the controls.